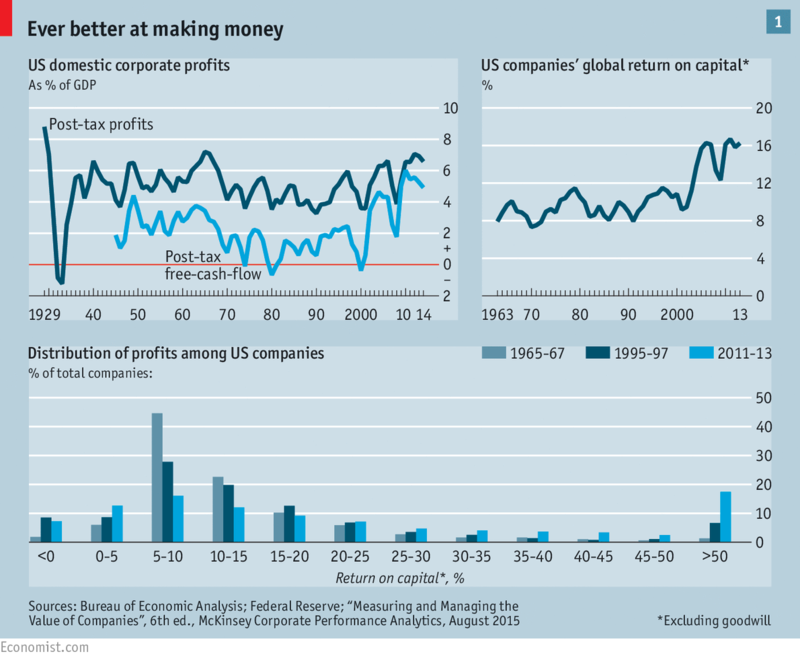 As the cover story in this week’s Economist highlights, the rate of profitability in the United States is at a near-record-high level, as is the share of corporate revenue going to capital. The stock market is valued very highly by historical standards, as measured by Tobin’s q ratio of the market value of the non-financial corporations to the value of their tangible capital. And the ratio of the market value of equities in the corporate sector to its GDP is also unusually high. This is an apparent problem for the secular stagnation hypothesis I have been advocating for some time, the idea that the U.S. economy is stuck in a period of lethargic economic growth. Secular stagnation has as a central element a decline in the propensity to invest, leading to chronic shortfalls of aggregate demand and difficulties in attaining real interest rates consistent with full employment. Yet matters are more complex. For some years now, real interest rates on safe financial instruments have been low and, for the most part, declining. And business investment is either in line with cyclical conditions or a little weaker than would be predicted by cyclical conditions. This is anomalous, as in the most straightforward economic models the real interest rate is the risk-adjusted rate of return on capital. And an unusually high rate of investment would be expected to go along with a high rate of return on existing capital. How can this anomaly be resolved? There are a number of logical possibilities. First, the risk associated with capital investment might have gone up and so higher rates of return could be simply compensating for higher risk rather than implying attractive investments. There are two major problems with this story. One is that available proxies for risk are not especially high in recent years. The chart below depicts realized stock market volatility and the VIX measure of expected volatility as implied by options. Another problem is that if capital returns have become far more uncertain, then the stocks should have become less attractive in recent years rather than more attractive. In the past seven years, the stock market has risen to 250 percent of its spring 2009 levels. A second explanation could be that a heightened demand for liquidity and a shortage of Treasury instruments, perhaps created by quantitative-easing programs, has driven down bond yields, widening the spread between the rate of profit and these yields. This story does not provide a natural explanation for the relatively weak behavior of business investment. Further, as Sam Hanson, Robin Greenwood, Joshua Rudolph and I pointed out in earlier work, the market is today being asked to absorb an abnormally high, rather than an abnormally low, level of long-term federal debt. On top of that, if Treasurys were in short supply, one would expect that they would have their yield bid down relative to market-synthesized safe instruments. Yet the so-called swap spread is actually negative and Treasury yields (vs. swaps) are unusually high relative to history. Third, it could be that higher profits do not reflect increased productivity of capital but instead reflect an increase in monopoly power. If monopoly power increased, one would expect to see higher profits, lower investment as firms restricted output, and lower interest rates as the demand for capital was reduced. This is exactly what we have seen in recent years! Is the increased-monopoly-power theory plausible? The Economist makes the best case I have seen for it, noting that (i) many industries have become more concentrated, (ii) we are coming off a major merger wave, (iii) there is some evidence of greater profit persistence among major companies, (iv) new business formation has declined, (v) overlapping ownership of companies that compete has become more common with the rise of institutional investors, and (vi) leading technology companies such as Google and Apple may be benefiting from increasing returns to scale and network effects. The fact that only the monopoly-power story can convincingly account for the divergence between the profit rate and the behavior of real interest rates and investment, along with the suggestive evidence of increases in monopoly power, makes me think that the issue of growing market power deserves increased attention from economists and especially from macroeconomists.